Southworth Sailor: Calvinistic Christmas Lights? Calvinistic Christmas Lights, a photo by Southworth Sailor on Flickr. Over the years I have taken a lot of teasing about my roofline Christmas lights. Some have dubbed my straight white lights, ‘the Dutchman lights.’ But this week I heard a new one. A friend came over for our weekly small group, and called them ‘the Calvinistic Lights.’ He proceeded to say they were straight and predictable. You can analyze them any way you want, but that’s the way I like them. And since I am the one bundled up battling the freezing north breeze, pounding in my reused galvanized nails, I’ll put them up the way I like them. Speaking of Calvinistic, we have been making a big deal about our Jesse Tree tradition this year. Bjorn and Jenny took up the practice using our family set of ornaments. This past week Esther shared the tradition at a ladies meeting, and we indulged a little Jesse sprouting in small group. For those of you unfamiliar with the Jesse Tree, it is much the same as an Advent calendar. Daily Bible readings trace the promise and foreshadowing of the coming of Christ. An ornament corresponds to the daily reading and it is added to the branch each day. We find that it is a wonderful way to remind ourselves of the amazing plan that God has to save the world, and how it all culminates with the coming Messiah. If you are interested in more resources about the Jesse Tree, Ann Voskamp has a nice download on her blog. Another site that has good children devotionals and provocative parent devotions is here. 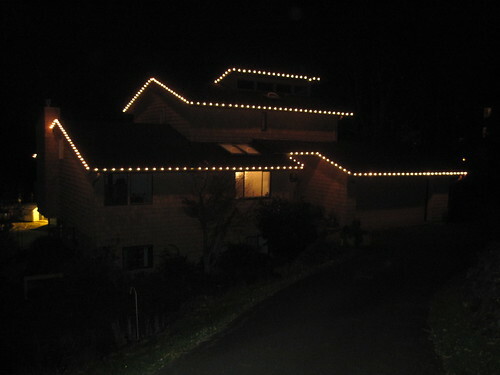 Don't worry about your roofline Christmas lights, they look great. Neatly organized, well maintained and mounted by someone who cares. It is different here in Norway, where basically no one have light decorations on their houses. Except for us, but that's probably only because we have seen what it should look like, when we lived in the U.S.
We wish all of you all the best for Christmas, many greetings from Kjellaug and Peter in Norway. Jesse Tree (typing error in last comment).